In 1987-1993 the Russians successfully assembled and operated the 124-tonne Mir station. Mir and its crews whirled round and round the world, through the collapse of the Soviet Union and Russian economic meltdown. 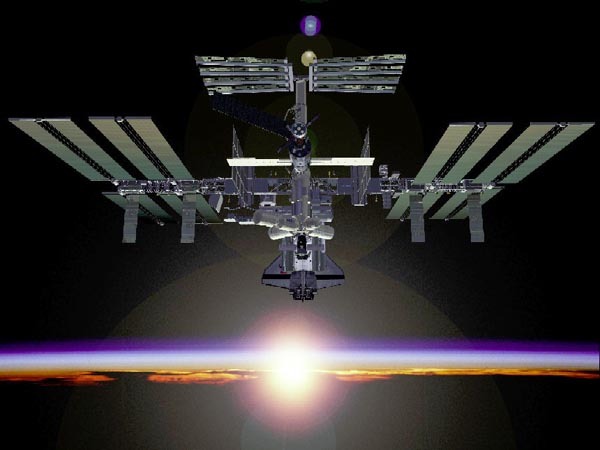 At the same time, NASA had scaled down its space station in the seventh redesign in nine years. This more modest station Alpha deleted most of the original science experiments, but would still cost more than Clinton was willing to spend. The projet is being organized and paid for by the US, Canada, Russia, Japan Brasil, and 11 European nations. By the year 2005 - if all goes according to plan. The first part for the station, knowm as Alpha ( which means first), were flown into space in November 1998. An estimated 44 such launches will be needed to complete the job. When finished, the "City in Space" will provide a permanent orbiting research complex for scientists, engineers, and entrepreneurs.